Every year around Christmas time, my father's family has a party. It is often the only time I see my cousins on my father's side during the whole year. My father has four brothers. They always give each other gifts at the party. Each brother gives the other brothers the same gift. One of the gifts my father received was a slow cooker cookbook. While I was home, we made this vegetable tray soup recipe from the book. My dad and I made the recipe using the leftovers from a vegetable tray, so we didn't have the exact vegetables called for in the recipe. We also used an onion and minced garlic in place of onion powder and garlic powder. The ingredients are 2 tablespoons butter, 4 cups broccoli, 3 cups baby carrots cut in half, 1 cup sugar snap peas, 1 cup sliced celery, 1 sliced green pepper, 1 14.5-ounce can chicken broth, 2 minced garlic cloves, 1 chopped onion, 5 cups milk, 3 tablespoon whole wheat flour, and 2 tablespoon cornstarch. To make the soup, we put the butter, broccoli, carrots, sugar snap peas, celery, green pepper, chicken broth, garlic and onion into a slow cooker. We cooked the vegetable mixture on low heat for six hours. After six hours, we put the whole wheat flour, corn starch, and 1 cup of milk into a saucepan. We whisked the sauce smooth and then placed the pot over medium heat. We stirred constantly until the sauce was thick. Once the sauce was thick, we slowly added the remaining four cups of milk. We poured the sauce into the slow cooker with the vegetables and stirred. We turned the heat on the slow cooker to high and let the soup cook for another half an hour. This was a light and healthy soup. It takes little preparation. It wasn't as flavorful as I had hoped. It was a bit bland. The soup was creamy and good, but the broth was nondescript. I wouldn't make this recipe again. I have been asked a number of times about making flavorful soup and the best advice I can give is: always err on the side of more, rather than than less. Vegetable soups are the hardest to make flavorful because a good, slow-cooked meat stock can do wonders for a soup, but the same base can apply. If you take your strongest vegetable that you like, (broccoli or cauliflower is good; you can use carrots or celery), and make a strong broth using a little onion, or leek as well,it will be stronger. 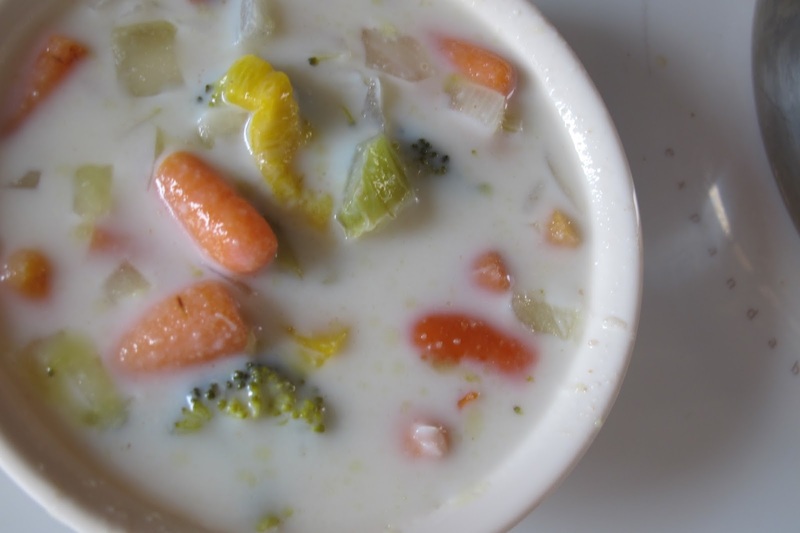 (Discard the spent vegetables before adding fresh ones to the soup). You gave me a good idea for an upcoming post! Thanks. I'm sorry it wasn't as good as you were hoping, but I LOVE the idea of veggie tray soup!!! Thanks for the good types Tonetta! I might need to give it another try... I'm a little sad it didn't work out better too Karen!